Following negative data last week, investors were clearly concerned about global growth and anxiously anticipated government actions. While Europe and the U.S. disappointed investors, China surprised on the upside by cutting interest rates. The market reacted positively, as the S&P 500 Index increased 3.7 percent. It's clear the government's tone in China shifted this week with the rate cuts. The government appeared to be comfortable with slower growth, but that position seemed to change as the country took steps to avert a hard landing and cut interest rates to stabilize the economy. Over the past decade, there were only two periods when the government reduced rates: once in 2002, and several times at the end of 2008. This time, rates were cut by 25 basis points each on lending and deposits. The one-year benchmark deposit rate is now 3.25 percent and the 1-year lending floor rate is now at 6.31 percent. 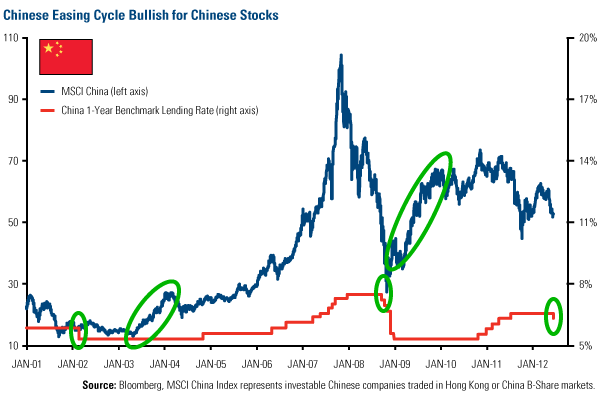 Historically, easing rates have been positive for the MSCI China Index. As we often say at U.S. Global Investors, government policy is a precursor to change. While there has been quite a bit of negative news lately, government policy is making a significant step toward growth. We believe now's not the time to be bearish. Analysts are only beginning to see signs of increased infrastructure spending, which should help spur growth for the remainder of the year. If you'll remember in 2011, China deliberately tightened its credit policy to stem inflation and slowed financing to local governments, says J.P. Morgan. As a result, fixed asset investment growth in infrastructure decelerated considerably, and railway investment was completely halted, decreasing nearly 20 percent on a year-over-year basis during the second half of 2011, says J.P. Morgan. Highway infrastructure spending "increased sharply" from January through April, particularly in Western China, says J.P. Morgan. The research firm says that the economic growth rates in the Central and Western areas of the country "already outpace those of more developed coastal provinces." Fixed asset investment for infrastructure, energy development and water projects in the Central and Western regions has grown at a faster clip than in the Eastern region on a year-over-year basis. Rail infrastructure has also picked up. As of the end of 2011, the Ministry of Railways received a credit line of more than $300 billion from banks, and plans on issuing additional railway bonds, seeking investments by pension funds and encouraging the private sector to invest, says J.P. Morgan. With fixed asset investment in the rail sector growing 34 percent on a month-over-month basis, this government support is "starting to be translated into action," says Macquarie Commodities Research. If we see spending in railways continue to increase, China will be able to meet their full-year target, according to Macquarie. China's GDP during the second quarter is likely to be about 7.5 percent, and the expectation for 2012 remains at 8 percent. While the country's GDP is lower than its 2010 high of 12 percent, it is helpful to put this in context with global growth. "Comparatively, it looks like strength--not weakness," reiterates ISI. What's important for investors to realize is that the combination of a ramp up in targeted fiscal spending combined with broad-based monetary easing is a positive dynamic not only for China--but for the global economy as a whole. John Derrick contributed to this commentary.